Stannary Brass Band is a registered charity (1091307) that is proud to have had the generous support of Tavistock businesses, a succession of town mayors and councils, the Church and other organisations. It has helped raise thousands of pounds for local charities and every year takes part in the Remembrance and St. George’s Day parades, the town carnival, concerts and fetes. The band has also travelled within the south-west peninsula and abroad to France and Germany. One of Stannary Brass Band’s main attractions is it’s accessibility to all ages from 6 upwards, whatever their musical ability or experience, with no discrimination over race, gender or social circumstances. The band lends players an instrument free of charge and offers free tuition so everyone should be able to afford to join. This gives a unique opportunity to everyone in our community. Stannary Brass Band is popular because it is one of the few organisations that offer the whole family an opportunity to be involved in something together. Over the years many families have joined the band and have developed their musical abilities together. Parents who transport their youngsters to band have been invited to have a go themselves and many have found a new interest – a family hobby. This makes the band like a huge family with a diversity of ages and backgrounds. It means that families can spend time together, can learn together, make new friends and enjoy the social side of the group as well as the music. In this economic climate Stannary Brass Band can offer a change in people’s lives that will not cost them money. It encourages family units to enjoy a healthy, interesting activity together which involves meeting and entertaining other people and helping others. We can give several examples of families whose lives have been changed by the band in a positive way. Some young players have continued their musical education at university, music academy or the forces. Others have become music teachers; several have joined first class bands and performed at prestigious locations. There have been players who have enjoyed the band despite their physical challenges. All have been taught a skill which they can build on and take with them wherever they go in the future. Stannary Brass Band believes in the importance of education, family values and offering opportunities to all. If you wish to become a band member, attend one of our concerts, help as a volunteer or learn more about us, please telephone 01822 854888. 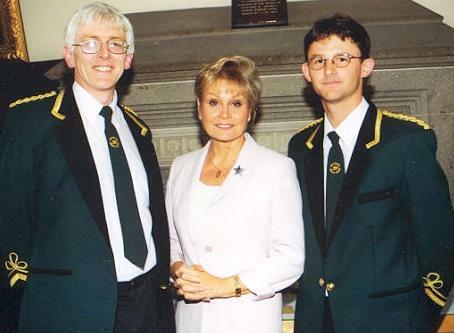 Photograph, courtesy of James Bird and The Tavistock Times Gazette, shows Steve Gray (chairman), Angela Rippon and Jon Benzie in 2002. 1996 Royal Television Society Hall of Fame. 2002 European Woman of Achievement. 2004 she was awarded an OBE in recognition of her services to Broadcasting, Charity and the Arts. 2017 CBE awarded for services to dementia care in her role as development lead with Dementia Friendly Communities. April 27, 2019 10:30 amBand recruitment. May 27, 2019 2:00 pmMary Tavy Fair. July 20, 2019 6:00 pmTavistock Carnival Procession. September 28, 2019 7:30 pmConcert in Yelverton.